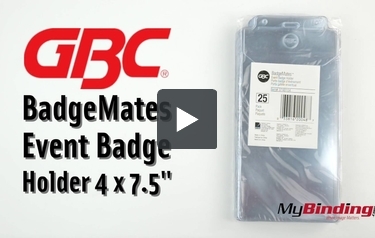 This GBC BadgeMates Oversized Event Badge Holder works with inserts up to 4" x 7-1/2". ? Made of ultra-clear durable construction, it's great for special events, concerts, conventions, and sales meetings. Get 25 holders with every order. Product number 3748104. Transcript: Welcome to MyBinding.com. These are the BadgeMates Event Badge Holders from GBC. Make your event badges big and beautiful with GBC holders. These holders are made from ultra clear vinyl for perfect visibility. The seams are all specially welded to stand up to wear. Just slip your event badge into the slot from the top and the top flap will keep it secure. The top has three reinforced holes, one wide and two small for whatever way you wish to attach them. This pack has 25 holders. For more videos and all your binding needs, go to MyBinding.com. Welcome to MyBinding.com. These are the BadgeMates Event Badge Holders from GBC. Make your event badges big and beautiful with GBC holders. These holders are made from ultra clear vinyl for perfect visibility. The seams are all specially welded to stand up to wear. Just slip your event badge into the slot from the top and the top flap will keep it secure. The top has three reinforced holes, one wide and two small for whatever way you wish to attach them. This pack has 25 holders. For more videos and all your binding needs, go to MyBinding.com.